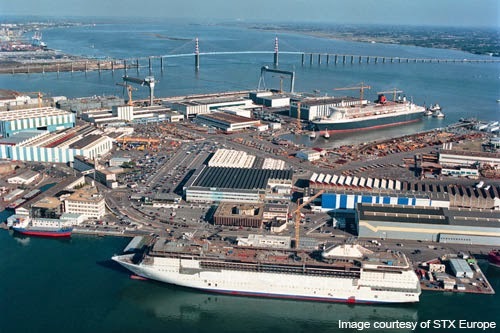 In a previous post I was musing about shipyards, ports, and other national assets that are often taken advantage of by being “privatized”, or otherwise utilized to enrich a select few. Meanwhile the states, and its people, are burdened with the cost of developing and maintaining these assets. I find this grossly offensive myself. We only have to look to the Soviet State and its huge infrastructure, “sold” for fractions of their worth – divvied up – amongst a select,well connected few, after the collapse of their government, creating this oligarch, class of unprecedented “wealth”. Meanwhile the rest of the people go starving, or otherwise have lost what they had worked for, for so long. I think shipyards are national assets, and should be run that way. Unless of course you have a completely independent business enterprise free of government intervention. I am naive but I haven’t seen any shipyard go without government subsidies to some degree. Politicians are dependent on those well paid, highly skilled jobs shipyards usually represent. Why does this matter? It matters because it changes the course of the nation. Take for example a country with an industrial base around building ships. Well call this country Spamily. 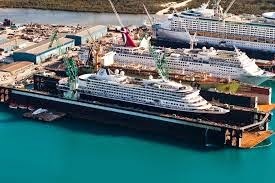 The government of Spamily is the major shareholder of a large shipyard group which builds cruise ships. This enterprise provides many jobs, and is important in keeping people busy, instead of seeing the corruption of the government in its various forms. The government becomes more and more dependent on this highly visible industry, and as a result they start underbidding contract to build ships. 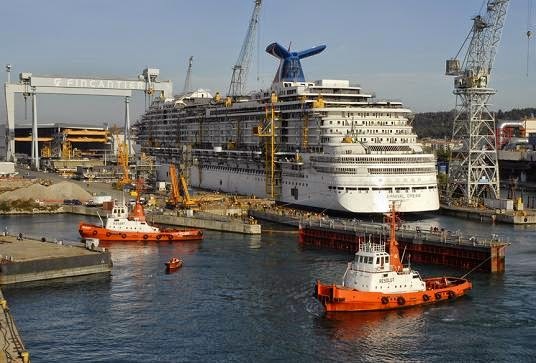 A cruise ship costing 900 million, is delivered to it new owner for $600 million. The difference in the value of that asset is where the problem lies. The owner has an asset worth $900m, having only paid $600m. The shipyard, and the country that supports it, paid $900m to build it. A simple transfer of wealth, but the people of Spamily now have a debt of $300m to make up – are those jobs really worth that? Like any credit, this does not appear to be a problem, at first. In government terms, the politicians hide the debt for years, paying off the interest alone, making the creditor happy, while still keeping people busy. By the time creditor starts getting jittery, because too many cruise ships have been built, and the difference has outweighed the asset value Spamily actually has, the politicians are long gone, their pockets happily lined. 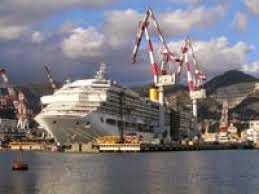 The ship owner now has a fleet of high value ships, that they only paid 70 per cent of – a net profit of 30%. As you can see this would be a great deal – for a select few. Meanwhile the creditor starts exerting pressure on Spamily and because all of Spamily’s “people” owe this debt, they must accept to give up their pensions, accept lower salaries, pay more for goods. They must accept policies that are dictated by their creditors. These creditors, may be the same people that actually owned the ships to start with. What a neat and tidy scam. That’s why I am interested in learning where the money comes from, and I think you should be too. Eventually the true cost – and the true cost will come out – and it will have to be dealt with. The value should belong to the people who have agreed to the cost, whether they knew or not, I guess therein lays the issue. Public assets paid by taxpayers, ought to stay public assets with public profits. But more and more these days we see our government “privatize” “money losing” assets for fraction of pennies, which the next day become huge privates assets. It’s stealing, its plain wrong, and it causes unnecessary hardship and strife to our fellow humans. ← Check out my Yas Yas ! Great insights thanks.. really very good views. Kodus!